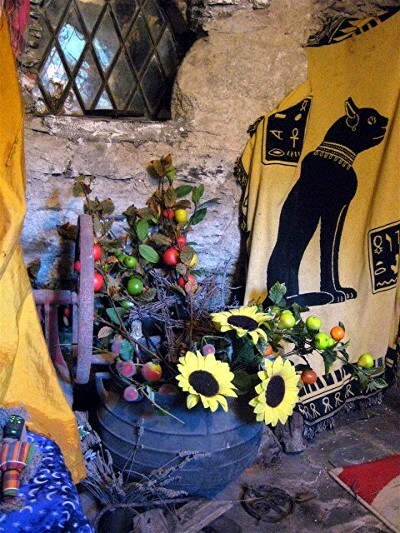 Two articles written for Isis-Seshat & Mirror of Isis were shared by Minette for Olivia this morning, and have been uploaded to the "Olivia's Letters" section (link below). They are entitled "The Four Donkeys of the Zodiac" & "How to Escape Control" and also include artwork. Enjoy! Recently we have had questions about whether we were going to publish The Call of Isis in booklet form, and the answer is yes! 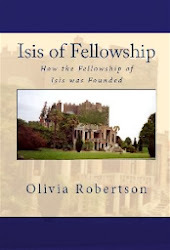 The Call of Isis is quoted by Olivia Robertson as being her "spiritual autobiography" in which she "vividly describes her adventures in the psychic, occult and mystical fields," during the early years of the Huntington Castle Centre for Meditation and Study. This was first published in 1975 - before the founding of the Fellowship of Isis. Olivia writes: "It's how it all happened." Six new photos of the ongoing work that Olivia Robertson is doing in the Temple. Many thanks to her, as well as to Minette for sending them. Titles and descriptions may be found underneath each photo. 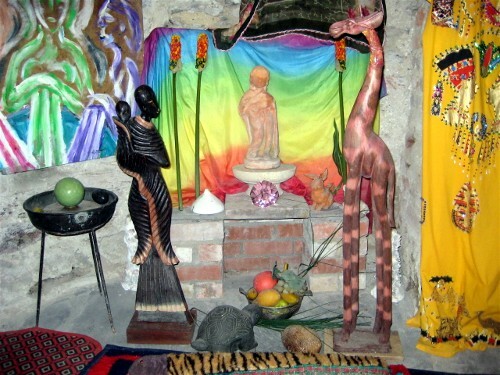 "Ancestress of the Gaels - By the Amon Ra Shrine of Leo. 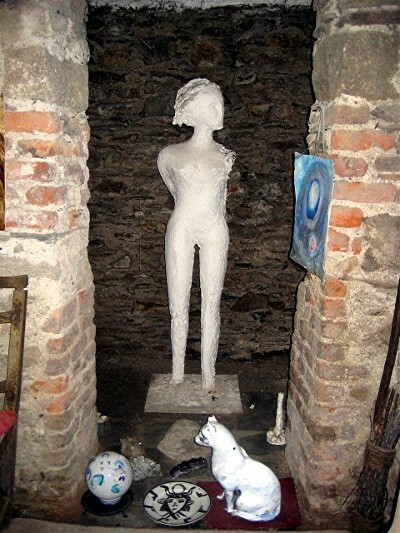 with Mooncat, sculpted by Anna Curry, David's sister"
Cerridwen by Her huge Cauldron"
'Inspiration - Splendid. Prophecy - A Burden. Shape-Shifting - Scary.'" Happy Sun in Aries! 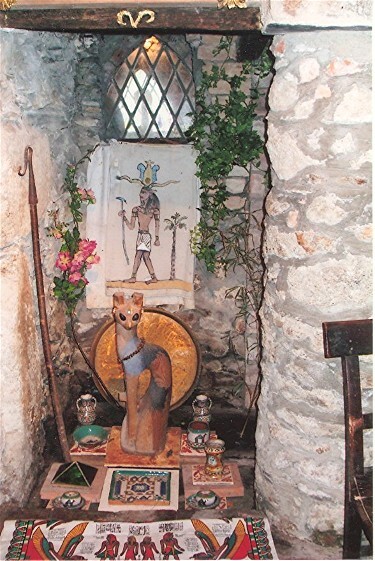 The above altar of the Shrine of Aries is dedicated to the Goddess Bast. It is located opposite the High Altar on the left side of a deep alcove, which had been the original hearth of the Castle. "Companions, on the quest for the Golden Fleece of Love and Life, know that Aries the Ram is Shepherd of the Starry Flock, leading the Zodiac procession round the encircling year! Shining unattainably in the bright sky are the gold cloud sheep of Phoebus Apollo. The flock's Ram bore Helle and her brother Phrixus on his back as they flew from the wrath of their step-mother Ino. Alas, Helle flew into the sea, hence called the Hellespont. 'First Golden Aries shines, who whilst he swam lost part of his freight, and gave the sea a name'. To this constellation belongs the starry Shepherd, Tammuz Dumuzi. As he sank to his death into the Western Sky Ocean, he was rescued by Ishtar, Goddess of the eight-pointed star Sirius. 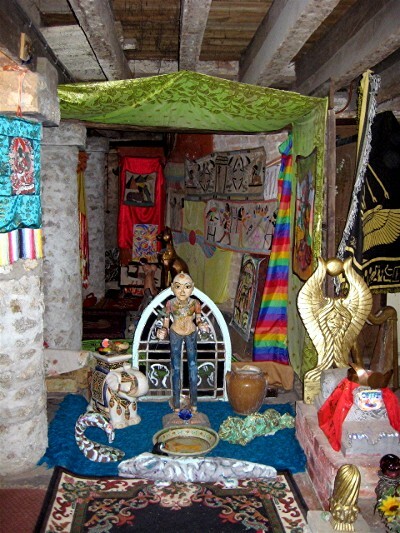 The mighty Amon Ra, Ram God of the Egyptians, reigns in this House. He is also the Agnus Dei, the Easter Lamb. His is the Golden Fleece. " 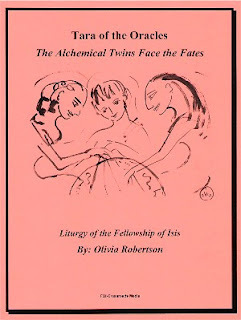 In honor of the Fellowship of Isis' 35th anniversary, we have added a new Gallery to the Homepage Archive - an audio gallery of over 40 clips of the FOI co-founders, Olivia Robertson and her brother, Lawrence Durdin-Robertson, speaking on various subjects, as well as enacting ritual. 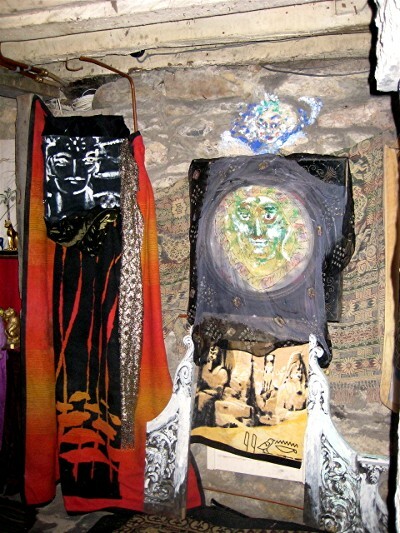 These have been compiled from FOI ritual CDs, as well as other tapes provided by Olivia. We hope you will enjoy this new gallery, and revisit often, as we continue to add new material. 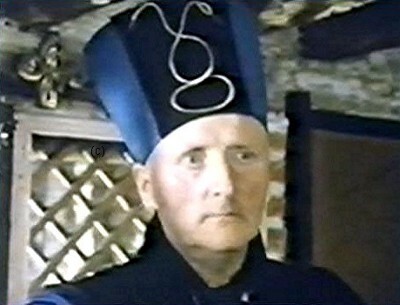 Happy 35th Anniversary Fellowship of Isis! Audio transcript: "It was direct spiritual experience, as with my brother, that I had a direct spiritual Vocation to do this from God - the feminine aspect of God - God who is also feminine to emphasize this, because the world is threatened by destruction, through pollution, through misuse of nature - often through stupidity and greed. We're destroying the planet. And the Divine Plan appears to be to emphasize the feminine: charity, kindness, care for nature, nurturing, motherhood - all that side. 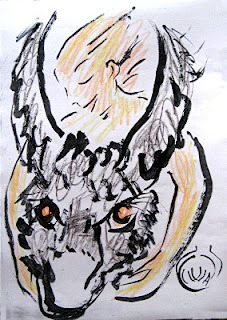 Not to get rid of the male aspect, but to balance male aggression and materialism and this linear-logical, mental thought: always analysis, analysis - we're more for healing and synthesis." Please also enjoy this audio clip of Lawrence, enacting the ritual of: "The Athenaea"
Audio transcript: "We are here assembled to celebrate the ancient Athenian Festival of the Panathenaea. The singer Orpheus instituted the Athenaea in honour of Pallas Athena, Goddess of Power, Wisdom and the Arts. 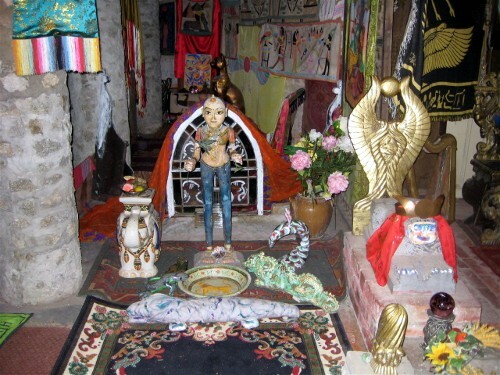 At this time of the Vernal Equinox of equal days and nights, when the sun leaves the sign of the tied fishes for the ram, Athenians and foreign visitors formed a joyful procession. They climbed the hill of the Acropolis and brought to the Parthenon the Peplum of Athena." send Her Blessings to all in Japan. 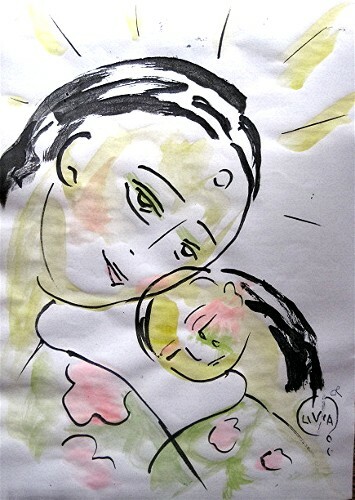 Olivia's drawing is entitled: "The Mother consoling Her Child". Many thanks to Minette and Olivia for sending this. Our thoughts and prayers go out to all who continue to be affected by the recent tragedies. 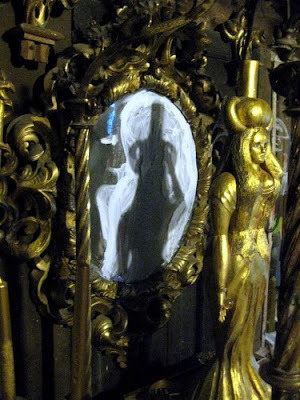 shows a "Mirror of Hathor," which reflects the soul's dreams. 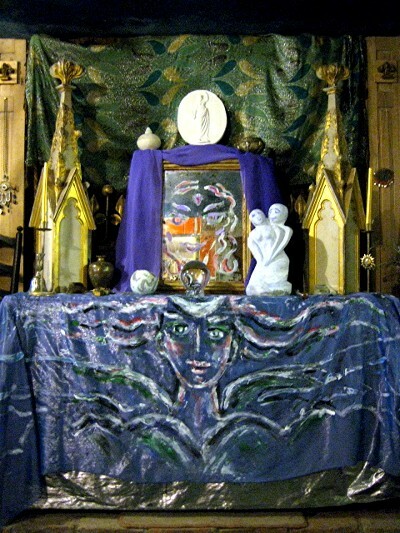 with outspread wings on the altar frontal. 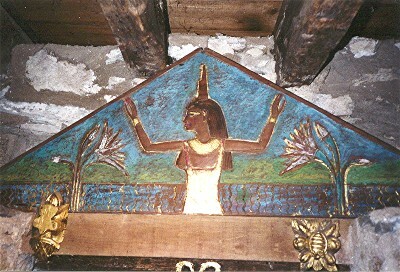 Hathor's Mirror in the Members' Chapel which she recently repainted. (These were taken on Wed. 9th March 2011)"
was represented in Greek philosophy by these Deities. to bring balance. Then Dionysos burnt down the Temple! and Dionysos in wild woodland. The Academic world and the Nature votaries still require Harmony." We have also added a new section to the Fellowship of Isis Homepage Archive, so you can easily view the ongoing changes in the Temple. 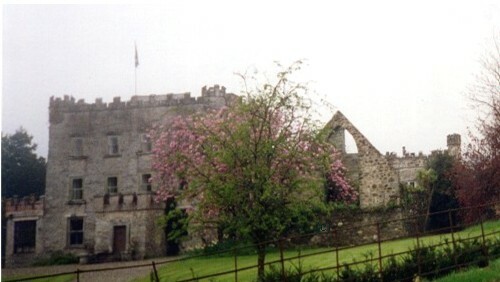 This "Temple Updates" link may be found on the left column under "Clonegal Castle", as well as in the Photo Gallery section. Our sincere thanks as always to Minette and Olivia! Photos copyright M. Quick, with additional enhancement by this website. Thank you to the producers of Olivia's video, Steven and Dennis, for forwarding this. Our prayers and blessings go out to all who have been affected by the recent earthquake and tsunami. 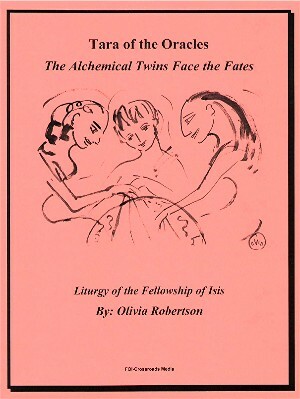 Olivia Robertson's latest liturgy booklet, Tara of the Oracles, has just been released by FOI-Crossroads Media. It includes full introductions, 26 illustrations and rituals, and a new original cover art of The Fates Transform the Earth. Olivia writes: "The Tara Booklets are magnificent! I've dedicated them to the Temple." Also, please know that the entire FOI Liturgy may now be ordered in printed form, from the Homepage Archive website. Each booklet includes complete cover art, illustrations, introductions and rituals as originally written by Olivia Robertson. Booklets are offered in 2-formats - large: 8.5" X 11" (good for ritual use), or small: 5.5" x 8.5" (convenient reading size). Olivia writes: "I love the easier larger format for our Rites!" 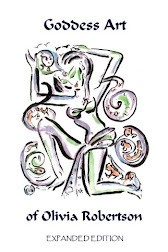 Since 2000, FOI-Crossroads Media has been offering manuals, ritual cds and booklets through the Homepage, after Olivia shared her publishing rights with us in 1999. 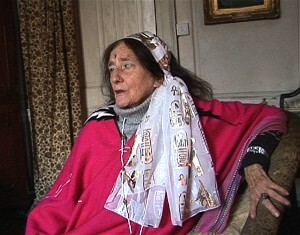 The first liturgy booklet offered, Nuit of the Milky Way, was published at her request in 2004. Now that she has decided to no longer personally ship her booklets by mail, and only offers them to those who visit the Castle, she has asked us to help provide this service to our members. Olivia has also given Isis House Publishing the rights to sell the liturgy, and there may be others in the future as well. We are honored to be one of the outlets producing the FOI Liturgy booklets. Additional Note: This website will send materials via our Isian Outreach program. Members who wish to contact Rev. Vincent, please contact us for his address. Wooden African Carving of Mother & Child. 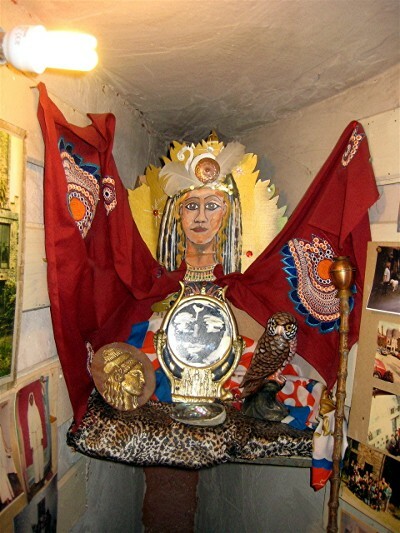 The Mother Goddess, Eke-Eyen. Behind, the 3 Artistic Creators, Pele, Brighid, Maya. Stone figure of Child of Gaia. 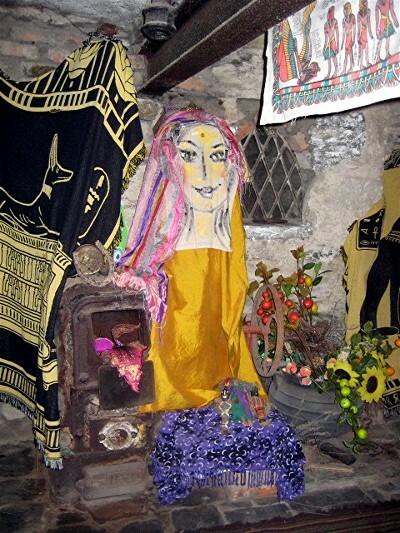 Painted cloth of Persephone, Queen of Hades. 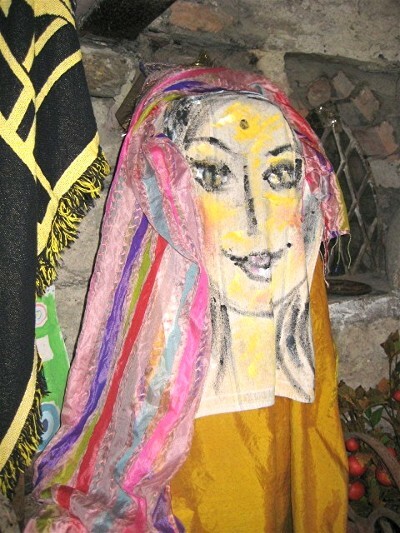 The Goddess Gangur, hand-crafted and painted by Devotees in Rajasthan village. She is connected with the Goddess Parvati. She 'protects from excessive male violence.' So She is Gangur the Protectress. Before Her is a bowl offering water to a jade dragon, a sea monster, a frog and a crocodile. An elephant bears fruit for the hungry. 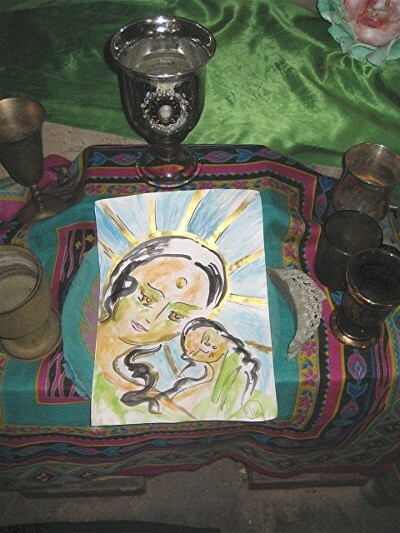 To the left is a banner of Green Tara, Goddess of Compassion. 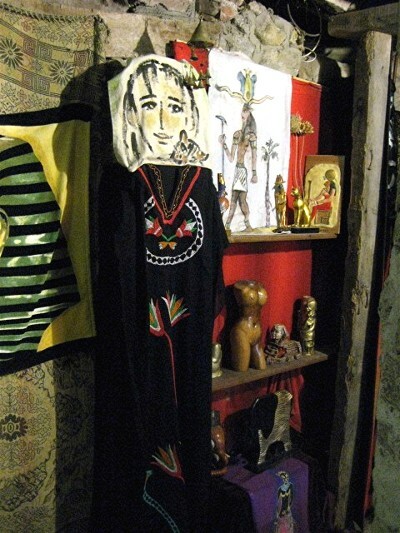 To the right is a wall hanging of Radha and Krishna, happy, divine lovers. He plays his magical flute. On the outside door to the Temple from the outdoor Chapel of the Goddess Persephone. Olivia has painted the Goddess Ariadne below a tiled picture of the Snake Goddess, which she got at Knossos in Crete. 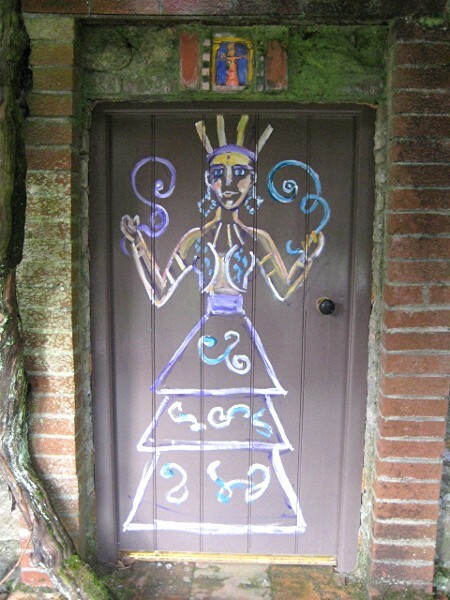 Ariadne is painted in front of the Outer Door of Her Labyrinth, which is the plan of the Temple of Isis with 5 chapels of the Elements and 12 Zodiac Shrines. She upholds 2 snakes, dual aspects of the Melusina - Kundalini Powers of Life. 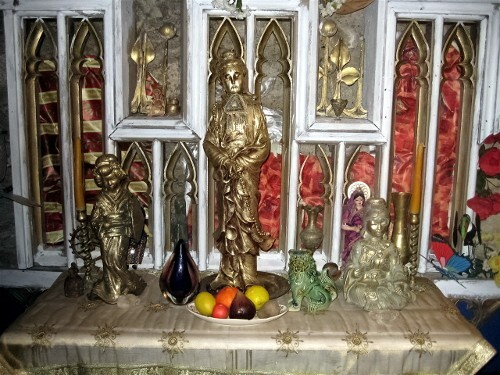 Our sincere thanks to Minette Quick for the photos and commentary found underneath them, and to Olivia for sharing her vision for the Temple.